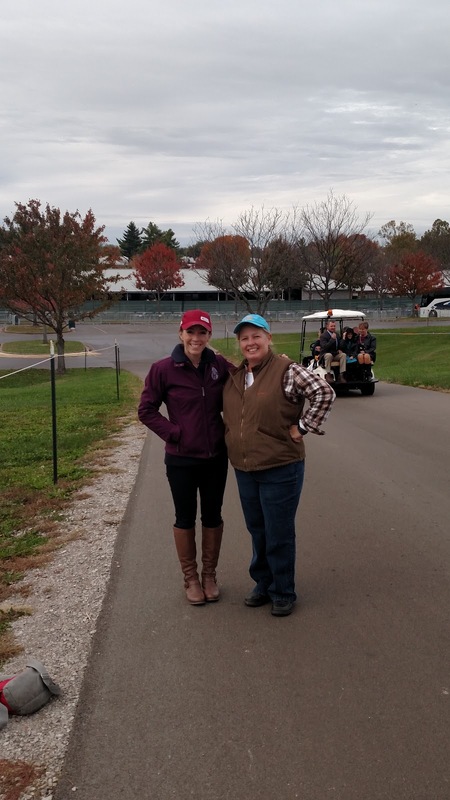 Cob Jockey: In Which My Mom Meets American Pharoah!! In Which My Mom Meets American Pharoah!! I've written before about my mom. About how I'm lucky to be able to trace my love of horses back to a parent. Not everyone can. She can't, her parents definitely didn't get it. But I could, thanks to her. My mom was nine when Secretariat won the Triple Crown. Imagine what watching him felt like to a horse crazy nine-year-old in the Chicago suburbs. She fell head over heels in love with the 'tremendous machine'. He was her hero, in the truest and purest sense of the word. Less than two decades later, she'd name her first horse after him: Little Red, instead of Big Red. Imagine also what it felt like when her two best friends got to meet Secretariat when they were still kids. My mom couldn't go, I can't remember why. They brought back a snapshot of him for her, and a lock of his mane they sneakily put together out of his brushes when no one was looking. It's my mom's most treasured possession; it's as close as she ever got to meeting him. The lock of hair goes with the pets and the people into the SafeShed in the backyard anytime a tornado threatens. 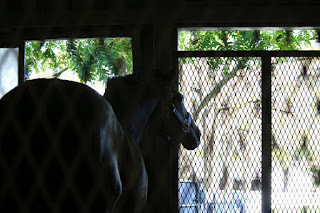 A photo of Cigar my mom took at my event at the KHP a week before he died. I realize that makes my mom sound crazy, but she's really one of the most rational people I know. She's just head-over-heels, nine-year-old girl in love with Thoroughbred racing. I went to equine college and, although I still love horses, began to see them from more of a business perspective than a little girl perspective. (Trust me, they weed out the "Barbie Horse" types out of the equine majors early on. It's for the best.) But my mom never lost that childlike love of them, and that's really special. Every May, we'd watch the Kentucky Derby together, with her starting the race sitting down clutching her Secretariat Breyer, and progressively and unconsciously crouching, then standing up, then jumping as the race progressed. And every year, I could tell she felt the disappointment of another year without a Triple Crown winner a little deeper than I did. Mom, the "Grand Pony" and me at Fox River Valley HT. 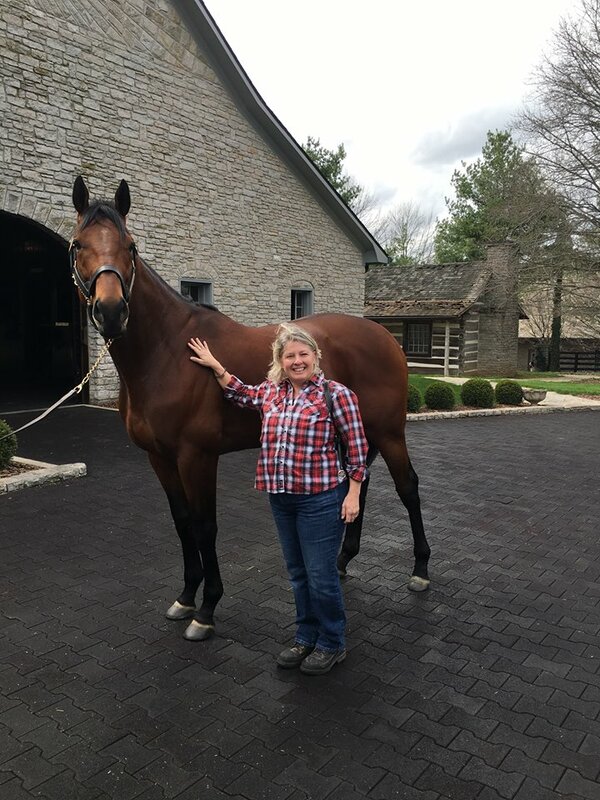 She'd deeply loved other racehorses since then - Seattle Slew, Cigar, Zenyatta, Rachel Alexandra - but when American Pharoah won the Triple Crown, she was totally smitten. We watched him sew up the Grand Slam together with thousands of other people at Keeneland last year, and it was so special to be there hugging her and screaming when he crossed the finish line. Here's where it gets fun. My dad, who could not care less about horses, is a magician with Christmas presents. He puts so much thought and care into them, from the smallest of gifts to the most elaborate. He's not the most outwardly affectionate guy, but his love for my mom really shows through in his Christmas presents, starting with the first Christmas memory I have, which was when he gave her Kentucky Derby tickets in Christmas 1991. She'd never been before then. The first and only time my dad has ever seen me ride. This year, her biggest present was one that took him weeks to procure: a trip to see American Pharoah in January. There weren't even public tours yet: he was told he couldn't get a ticket unless he was a "rock star, famous breeder or A Rod" according to Coolmore Ashford. He was told "No", multiple times. Still, he persisted, and finally a random trainer connected him to a random release of tickets on sale at 10am on a weekday. They were in, and he gave her the news Christmas morning. But it snowed that January weekend, big time, so the trip was delayed. Until yesterday. That huge smile says everything you need to know. A nine-year-old girl meeting her equine hero. He's only four, but this picture was four decades in the making. He was everything in person that they say about him in the articles, she said: easy for his handlers, doesn't need a lip chain, ears pricked the entire time, clearly happy just to be touched by anyone. He even nickered at them when he saw them coming. I couldn't stop staring and smiling at that picture for a long, long time after my dad posted it this afternoon. Whoa, that last picture made me tear up! How cool for your mom! Gotta be honest, me too! She's walking on cloud nine. This brought tears to my eyes! What a beautiful gift for your mom, and how special that that horse crazy 9 year old little girl still lives in her. It was amazing. I'm so glad I could share it with all of you guys. Your dad totally wins at gift giving!! What a great story and so glad your mom's childhood dream could come true! He is amazing! Me too, she is just elated. I don't know you or your mom, but this story still made me misty eyed. Horse mom's are the best! Awww, this is just the sweetest!!!! It's awesome. I can't stop smiling. It's been a day and I'm still smiling as I type these comments. Ha, everyone in my immediate family is pony-sized! She's just a little bit taller than me. Wow, your dad wins forever. This is amazing. He really does. I was like "You know you can't top this, right?" Awwww this story has all the feels. What an amazing experience for someone who so richly deserved it. I'm so glad I could share it with you guys. She really does. I told her not to read this in public because she's going to cry. :D :D :D I seriously have been smiling like this for a whole day! This is so amazing and your dad seems like such a wonderful person! OMG - I love that last picture. :) What a spectacular treat for her! And American Pharoah looks like a sweetheart. Totally just teared up over that last picture in my cube at work... What a fantastic story! This hit me right in the feels, what a wonderful story! This story brought tears to my eyes! Love, love love. And the bond of horses between you and your mom is special - always treasure that. That is so cool -- what a great story and picture! Coolest thing ever!! So lucky!